In Nao’s first pages, she describes the diary as a last project before threatening to “Exit my existence. I’m counting the moments.” Her goal is to chronicle the life of her beloved great-grandmother Jiko, a progressive Buddhist nun over 100 years old. But the diary ends up telling us more about Nao and ultimately about Ruth herself, as she processes the 16-year-old girl’s experience. This setup for “A Tale for the Time Being,” the new novel by Canadian-American writer Ruth Ozeki (“My Year of Meats”), allows for a fascinating multigenerational tapestry of long ago, recent past, and present. 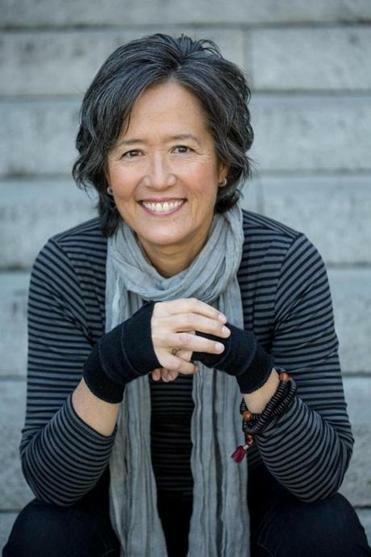 The work is fiction, but intriguingly self-referential — Ozeki’s mother is Japanese, she is an ordained Zen Buddhist priest, she lives with her cat and her husband, Oliver, on Cortes Island, B.C. — which adds yet another layer to the exploration of the nature of time and reality. Throughout, the fictional Ruth wonders if Nao really exists, and if so, what might have happened to her after throwing these precious artifacts into the ocean. Is she alive and still suffering from the struggles plaguing her teen years, or did she fulfill the promise of the diary’s introduction? Or have many years passed? Nao calls herself a “time being,” anyone who “lives in time.” Her diary, which is charmingly offbeat, clever, funny, and heartbreaking, reveals the isolation, displacement, and loneliness of a girl trying to fit in at school in Tokyo after her father loses his Silicon Valley tech job and grapples with his own depression and suicidal tendencies (which Nao refers to as his second hobby). On top of the fraught cultural transition and troubled home life, Nao also has identity issues that stray beyond normal teen drama. Certain diary entries strain credulity, such as Nao’s descriptions of the complicity of teachers and an elaborately staged mock funeral. But most of the writing resonates with an immediacy and rawness that is believable and touching. The stack of letters tucked into the diary offer another dimension of time and reality. They prove to be missives to Jiko written by her son as he counts down the days until he will be asked to make the ultimate sacrifice as a World War II kamikaze pilot. His descriptions of the barbarous training used to toughen bodies and harden hearts is devastating. But he writes with the eloquence, passion, and reflection of a philosopher poet, and what he endures emboldens Nao to withstand her own tormentors. Ozeki powerfully evokes Ruth’s present-day struggles, painting a vivid portrait of life on a sparsely populated island, where frequent winter blackouts plunge residents into grim isolation. Missing the stimulation of her pre-marriage life in Manhattan and blocked in her own writing attempts, Ruth feels trapped in “a fog-enshrouded outpost on the mossy margin of the world.” But Nao’s diary becomes a lifeline to another time and place more vibrant than her own, offering a vehicle for transformation, with the experiences of the past serving as catalysts for the future.